After several blocks in the heart of Times Square were pedestrianized and protected bike lanes were added to five avenues in the middle of Manhattan, motor vehicle traffic is actually moving more smoothly than before, according to the latest release of NYC DOT’s annual Sustainable Streets Index [PDF]. The report, which gathers data from the MTA, the Taxi and Limousine Commission, and DOT’s own counts, also shows that the volume of traffic entering Manhattan has basically stayed flat since 2009. At the same time, transit ridership has started to rebound from the recession and service cuts. Even with population and employment levels increasing after the recession, car traffic into the Manhattan CBD declined 1.7 percent in 2011. 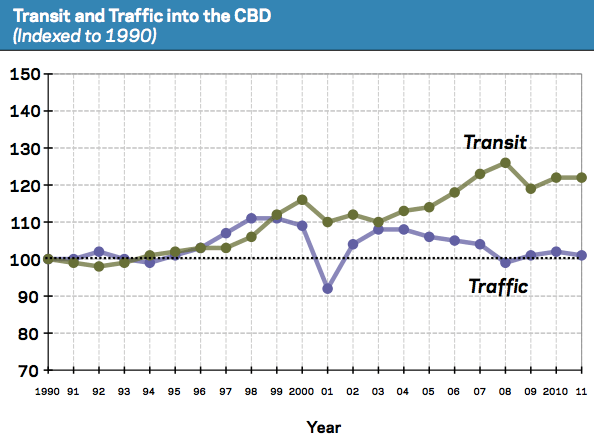 Since 2003, traffic volumes are down 6.5 percent, while transit trips to the area have increased 11.3 percent. Manhattan’s business districts aren’t the only places where transit is on the rise as driving volumes fall. According to metrics incorporating car crossings between boroughs other than Manhattan, citywide traffic volumes declined 1.8 percent in 2011 from the previous year, while transit ridership increased 0.4 percent, despite service cuts and fare hikes implemented the year before. The most recent numbers are in line with a long-term trend: Since 2003, NYC transit ridership is up 9.5 percent, while driving counts have fallen 3.9 percent. The notable exception to the increase in transit growth has been the city’s bus system, though data from 2012 indicates that bus ridership may be on the rebound. From 2008 to 2011, local bus ridership fell 9 percent citywide. Then in 2012, weekday bus ridership rose 0.8 percent. Meanwhile, weekday subway ridership rose 1.8 percent in 2012, surpassing its previous peak in 2008. The annual report incorporates numbers on bike-share usage. Between the Memorial Day launch and August 26, Citi Bike riders made more than 2.5 million trips covering more than 5.5 million miles. There have been eight crashes involving Citi Bikes, none causing injuries classified as serious. Of stations sampled during the final two weeks of July, the busiest included those near hubs like Grand Central Terminal and Union Square. The Sustainable Streets Index is part of the city’s PlaNYC 2030 sustainability initiative and builds on previous releases from 2008, 2009, 2010, and 2011. The report also includes before-and-after analysis of major street redesigns, as required by a city law enacted in 2008. This year’s report includes ten of these projects, including parking reforms and plaza space in Jackson Heights and the redesign of Grand Army Plaza. In Jackson Heights, a comprehensive neighborhood transportation study led to the reconfiguration of bus routes, parking, and traffic patterns. The result? Crashes with injuries are down 26 percent, while bus speeds on the Q47 have improved as much as 25 percent. The addition of pedestrian space at Grand Army Plaza nearly doubled the number of people walking to the Soldiers’ and Sailors’ Memorial Arch, with the number of people using the plaza’s central public space up 96 percent. In downtown Flushing, expanded sidewalks, relocated bus stops, and new turn restrictions led to a 30 percent decline in crashes causing pedestrian injuries and a 50 percent decline in crashes causing injury to drivers, while peak-hour traffic on Northern Boulevard is moving up to 37 percent faster. This is the final Sustainable Streets Index released by the Bloomberg administration, and it demonstrates the benefits of many of the street design innovations pioneered by NYC DOT under Janette Sadik-Khan. The next mayor has the opportunity to extend these benefits to more streets and more neighborhoods across the city. A taxi going at least 55 on Amsterdam and 65th nearly ended my life yesterday because he wanted to use the lane I was biking in to make his turn even though the light was yellow. It was a game of inches and when he couldn’t make the light, he just ran through it anyway. The expected speed of *anything* in an urban area should be estimated at 12-25mph *max*. Even in less-dense-than-NYC urban-scapes like LA, the average speed from one part of town to another rarely exceeds 25mph. That’s one of the big disconnects between drivers and reality; because cars occassionally go faster than the average speed, we estimate our trips improperly, and generally wind up thinking that the advantage of cars over bikes, skates or even walking is going to be much greater than it really is. Believe it or not, this was actually predicted. The closure of Broadway to cars was *intended* to make traffic flow more smoothly, and this is all spelled out in the original plans from Sadik-Kahn’s office. DOT plans to add protected bike lanes on 26th Street and 29th Street in Manhattan, with other crosstown routes in the works for Midtown.